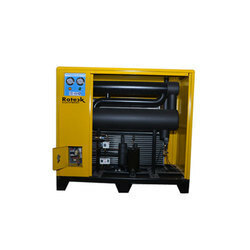 Providing you the best range of compressed air dryers, refrigerated air dryers, direct driven rotary air compressor, heatless dryer, refrigerated air dryer and heatless compressed air dryer with effective & timely delivery. 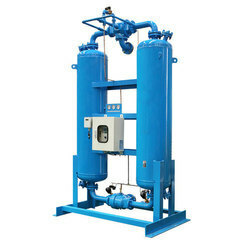 Backed by rich industry experience and knowledge, we are engaged in offering our esteemed clients Compressed Air Dryers. The offered dryers are precisely designed under the guidance of our skilled professionals using excellent quality raw material and modern technology in line with industry norms. Apart from this, we offer these dryers in different sizes and specifications for our clients to choose from us at the reasonable price. Owing to our expertise, we have been able to offer our clients impeccable quality Refrigerated Air Dryers. The offered air dryers are manufactured using premium quality raw material and modern technology in line with industry standards. Our provided air dryers are available in various sizes, designs, and specifications. In addition to this, customers can avail these air dryers from us at market leading prices. 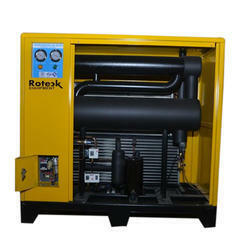 We have emerged in offering our valuable customers a wide array of Direct Driven Rotary Air Compressor. The offered range has selectable quality mechanical and electronic drainage system. These dryers are offered by us in various in a spectrum of specifications at industry leading rates. Our esteemed organization is counted among the most trusted manufacturer, exporter, trader and supplier Heatless Dryer. The dryers we offer in this range are designed and engineered under the guidance of our adept professionals who utilize advanced techniques and basic materials in the manufacturing process. Moreover, each dryer is ensured for its delivery within a promised time frame. We are offering Refrigerated Air Dryer to our clients. 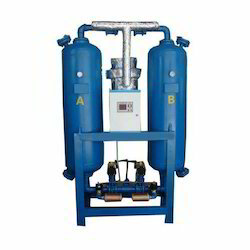 Heatless Compressed Air Dryer is the simplest form of desiccant type (activated alumina / molecular sieves) air dryer (drier) for achieving a dewpoint of -40°C or better for compressed air systems. It is the simplest design, which is virtually fully automatic and maintenance free. These heat fewer type dryers do not require any heating for re-generation and therefore are very simple in design and smooth in operation. In heatless dryers, two vessels are filled with desiccant, which cycles automatically, producing dry air continuously. In these units, wet air enters the bottom of one vessel and passes upwards through the desiccant bed where the moisture is absorbed. The dry air comes out from the top. A small portion of dry air is passed downward through the desiccant bed in the second vessel, which is under regeneration. Then the moisture-laden purge air is vented out to the atmosphere. The purge loss is around 10-15 % of the total air flow. At the preset interval, the vessels changeover automatically and dry air is available continuously, without any surges, the purge air requirement is around 10-15 % if (-) 400C dew point is needed from heatless type Air Dryers. Easy to install & operate, requiring very few, low-cost spares.